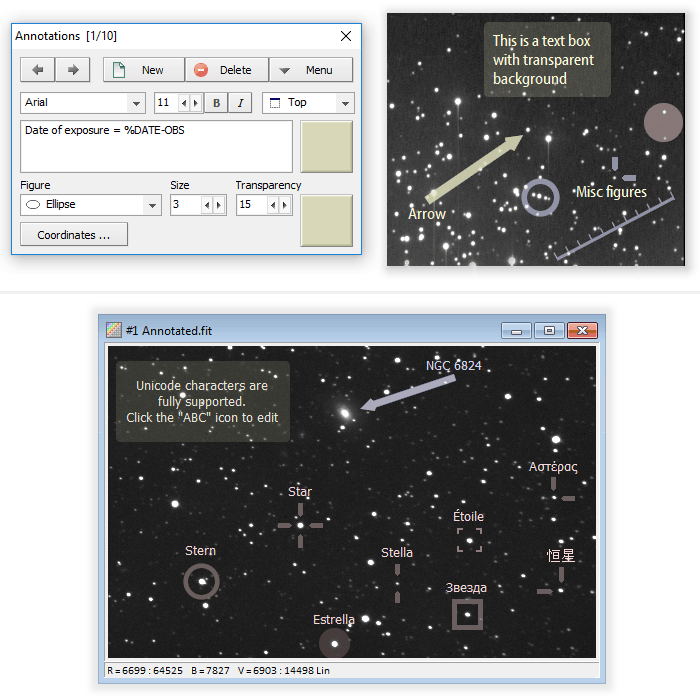 The astrometric and photometric calibration was the main feature of Astroart since version 1.0. 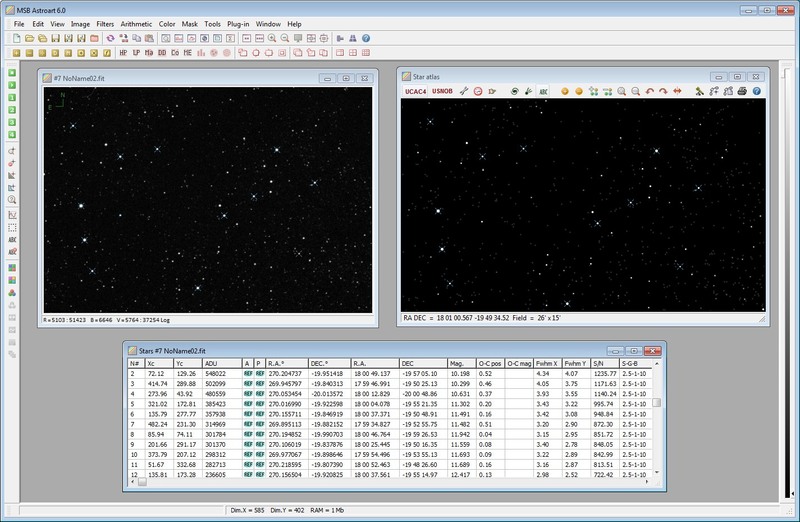 It is assisted by a star atlas which supports several catalogs (UCAC 4, GAIA DR2, USNO B, GSC etc). With just a few mouse clicks it's possible to assign the reference stars of the image, for the subsequent reduction. 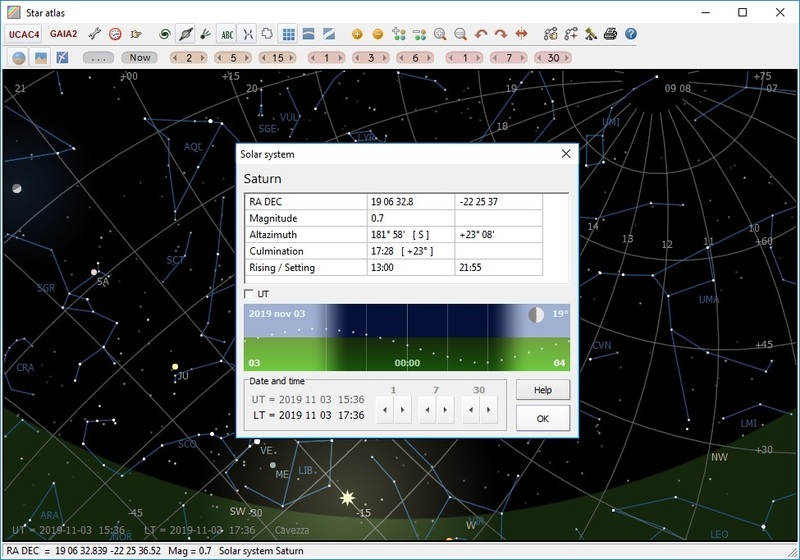 Since 1998 many amateur astronomers have used Astroart for astrometry and photometry of minor planets and variable stars. The following example shows the Preprocessing Window with its file boxes filled by simple Drag & drop. In a few seconds all the images are corrected for dark frame, flat field, aligned and summed into a single image. Astroart automatically creates a correct report from your measures, saving you a lot of time. This is a very fast star atlas optimized for millions of stars. On a standard PC (2 Ghz) it can explore the star fields at 20 frames per second (all stars, up to 21° magnitude) For every star it's included the maximum error of position and magnitude. All minor planets are calculated and displayed from the MPCORB catalog in a fraction of a second, will a precision better than one arcsecond. The atlas can be used rotated by any angle to easily compare a photographed zone. 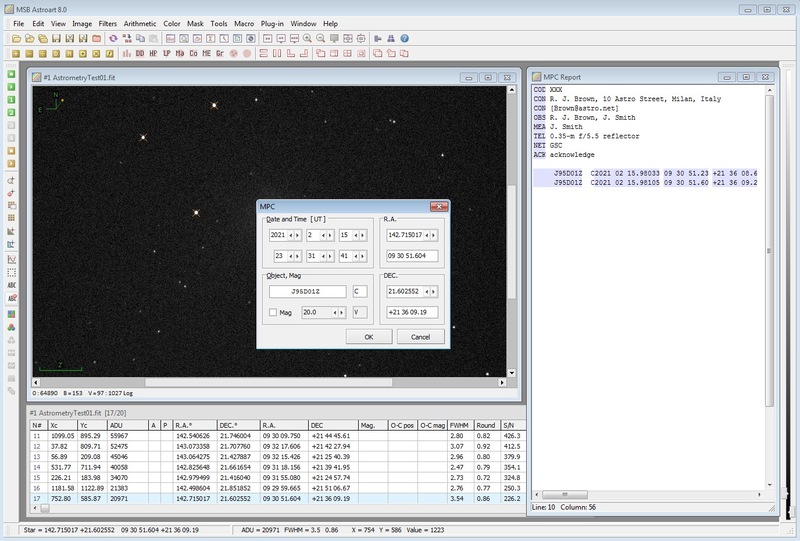 Astroart contains a precise and fast plate solving engine, to assign astronomical coordinates to an image automatically. This feature can be used also with telescopes, to automatic center an object after a GOTO, also when the object is outside the field of view. Annotations are figures and label placed over images, on an separated layer. They are saved as Comments in the FITS Header, so they are not lost even if you process the image with other software.